We currently have 7 Texel/Dorper crosses and 11 Kathadins which allows us to customize the working groups available from heavy to light. Our ducks are bantams or bantam crosses. 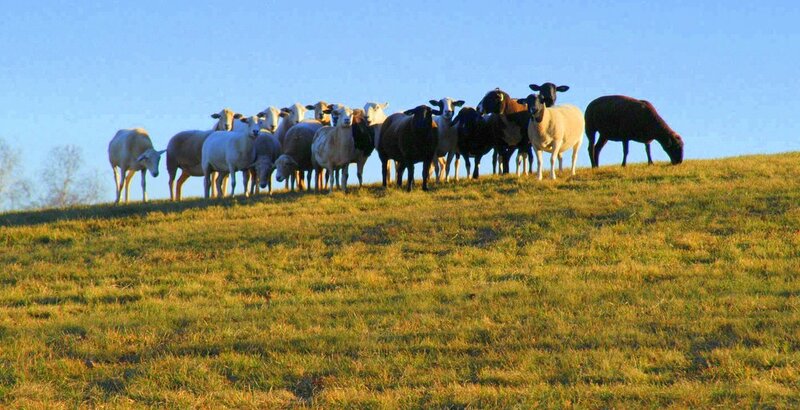 All herding breeds, and other breeds with a tradition of use as herding dogs, are welcome to train at Balgrae. If we have never met you or your dogs, your first rental session will have to be at a time when you can be observed. This is to insure the safety of our livestock. You will be asked to sign a hold-harmless agreement before working the first time. When you reserve time, please specify the number and type of stock (sheep/ ducks/ heavy/ light) you would like to work and which field or fields you would like to use. If you are planning to work more than one dog, please specify all areas you will be using so that the stock can be in place when you arrive. Stock time is rented in one hour blocks but we would like you to feel free to take short breaks as required to make the training sessions more meaningful to you and your dogs. A heated/air conditioned tack room is available in the barn for breaks if you would like to use it. We will try not to rent adjacent fields at the same time unless you specify that this is acceptable. If you are planning on working occasionally, the cost will be $25/hour for one dog or $30/hour for two or more. If you are planning on working regularly, a "package" plan, is available. For $100 you can purchase 5 hours of training time for one dog or 4 hours for two or more dogs.